Limited number of free tickets available for Union County LGBTQ youth age 16-19. 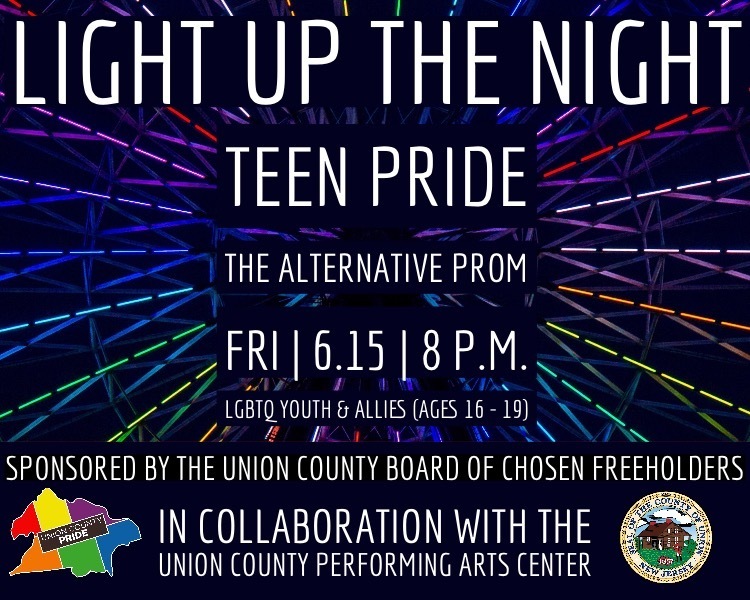 Union County, NJ – The Union County Board of Chosen Freeholders and the Office of LGBTQ Services are proud to host the first ever Union County LIGHT UP THE NIGHT – TEEN PRIDE celebration for LGBTQ and ally high school youth, ages 16-19. With support from WellCare Health Plans and the Union County Performing Arts Center, teens throughout Union County are invited to enjoy a safe and welcoming night out on Friday, June 15 at Hamilton Stage, located at 360 Hamilton Street, Rahway. The doors open at 7:30 p.m. and the festivities begin at 8:00 p.m. Dance the night away until 11:00 p.m. for an inclusive evening of fun, light refreshments, DJ, drag queen emcee, and the crowning of the Rainbow Court. “We are offering the Light Up The Night celebration to provide LGBTQ youth in our community, and their friends, with an opportunity to have fun being themselves in a safe and inclusive venue. I am proud to support Union County’s first teen pride event, and I thank my colleagues on the Freeholder Board for joining with me,” said Freeholder Chairman Sergio Granados. “Light Up The Night invites you to enjoy being yourself and make lifelong memories just as you are. Wear whatever makes you comfortable, glam it up, or wear neon or white to light up the night. Come on your own, with a date, or with a group of friends,” said Freeholder Alexander Mirabella, who is the Freeholder liaison to the Union County Office of LGBTQ Services. The first 70 tickets are free for Union County youth ages 16-19 while supplies last. These donated tickets may be ordered from the Performing Arts Center box office by phone at 732-499-8226, or by visiting the box office in person. The Box Office is located at the Performing Arts Center Main Stage, 1601 Irving Street in Rahway. Online sales are not available for the donated tickets. Those purchasing tickets at the regular price of $25.00 each may order online at ucpac.org (the ticket link is located near the top right area of the window). Safety is the priority. Security will uphold a strict no tolerance policy for drugs and alcohol. Bags will be checked upon arrival. High School Student ID, with parental consent and photo release is required to be admitted with each ticket. The Union County Office of LGBTQ Services is organizing this year’s Union County PRIDE events. Established as part of Chairman Granados’ 2018 Moving Union County Forward initiatives, the Office of LGBTQ Services, under the Division of Outreach and Advocacy in the Department of Human Services, is the first County government office of its kind in the State of New Jersey. It provides a platform for leadership and collaboration to support equality, serving as a catalyst for advocacy, awareness and action. For more information about the Office of LGBTQ Services, contact Danni Newbury, coordinator, at 908-527-4742 or dnewbury@ucnj.org.